We provide full custom setups for customers wanting an aquarium that will be a pleasure to own. Our AquaPonic Aquariums are low maintenance holistic ecosystems that replicate nature. The plants above the tank remove toxins from the water providing a biologically stable environment on a continual basis. This means you have to do less maintenance than with conventional fishtanks. Filter cleaning is around every 12months and water changes are a suggestion not a requirement. You spend less time maintaining them and more time enjoying them. Our new range of APAquariums are the ultimate freshwater setups. We have been working on the design for a few years now and we are finally happy to go to market with it. They are more expensive than others but they save time. Time is the most valuable resource in the world. You will never be able to buy any more of it. We are able to design your custom aquarium with your existing furniture and color scheme in mind. We use repurposed material as much as possible. The steel and wood used in this model were all scrap materials. The idea of repurposing material really resonates with us. "Repurpose , Reuse and Replenish the Environment"
The engine behind the ease of maintenance is Poret Filter Foam. Using the Hamburg Matten Filter ensures biological stability and great clarity. Cleaning intervals are long between and easy. There are no hoses or canisters that can leak. If there is a power cut the beneficial bacteria (the aquariums liver) are not starved of oxygen. The AquaPonics part of our aquariums is fueled by your fish as Nitrates (NO3) and powered with SANRISE LED lighting. The benefits of the plants are fewer Nitrates and Phosphates. They beautify your home and plants like the Pothos (Epipremnum aureum) remove toxins from the air. 270 degree view of one our APA Nano aquariums. It shows the 3 different views of a natural looking aquascape. Let us teach you how to care for your fish with our rent to own option. The best bit is that we can teach you how to maintain your aquarium. We look at this as our rent to own option. It gives you the helping hand and support to gain all the fishkeeping success. We maintain the aquarium for 3 months and in that time pass on our knowledge. After that time we are only a phone call away and always have an action plan to deal with any fishkeeping issues. Its our service that sets us apart from any other outfit. Our passion for fishkeeping is what drives us. APA Nano package without a stand is priced at $475 Incl GST. 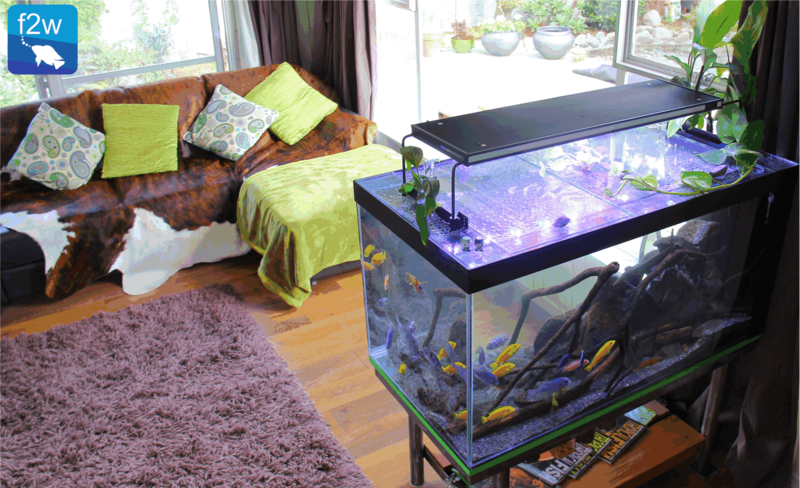 Aquarium size up to 60 liters of water with glass covers. APA Small package without a stand is priced at $725 Incl GST. Aquarium size up to 150 liters of water. If you are looking for more information on a larger unit like the one pictured below fill out the form and we will get back to you.